Snowy road conditions meant some travellers did not risk the journey to TBYC (although at least two regulars on the circuit had disappeared off on ski-ing holidays – no, I don’t understand why you would do that instead of sailing, either.) So four travellers joined seven TBYC sailors on a cold but breezy (snow-free) day to complete three brisk races, back to back. An offshore, gusty breeze made for different tactics off the start line for the first mark – the choice was to risk the more unstable wind strength and direction in shore to pinch the mark in one fetch or blast out into clearer air and accept the additional two tacks. It was hard to tell who had made the right call until the very end of the leg – inshore just about paid with Paul Grattage leading round the first mark, followed by Jenny Ball – the rest of the fleet converging behind on the mark with lots of shouting as a result. Paul set off downwind in search of the mysterious Mark 13 – some distance out into the estuary, largely invisible and entirely not in line with Marks 8 and 3, which it should have been. The local fleet behind Paul and Jenny headed higher and eventually the mark was spotted, particularly once the RIB worked out what was going on and headed over to help show where the mark was. A cracking reach down to the next mark was followed by a beat back through the finish line. Paul continued to lead the way, although with the fickle breeze, Jenny caught him up on the downwind leg – but Paul held her off round the leeward mark. The wind was gusting stronger as the race progressed and took its first capsize casualty – Jim Bowie – whose mainsheet had disappeared down to the bottom corner of the transom, just in time for him to have to bear away behind Daren Fitchew crossing on starboard. Paul went on to win the race, with Jenny second, Daren third and Jon Pearse in fourth. A slight pause between races allowed Jim to get ashore and replace the batten he broke during the capsize – and for the safety boat crew to switch over and therefore not succumb completely to hypothermia. Race two start saw a similar split of tactics – but again, risking the more fickle wind in-shore paid off for Paul, Jenny and Mark Dean. This time the home fleet went too high for the elusive Mark 13 – Paul and Jenny spotted it in time to head for it in a largely straight line – pursued by Jim, Daren and Gerald Sverdloff. The beat back through the finish line also presented a tactical decision – sail up the lay line in clearer air but punch the tide and risk ending up on the wrong side of one of the many shifts – or head all the way inshore and try to pinch through the line. For the first lap, the former paid off. 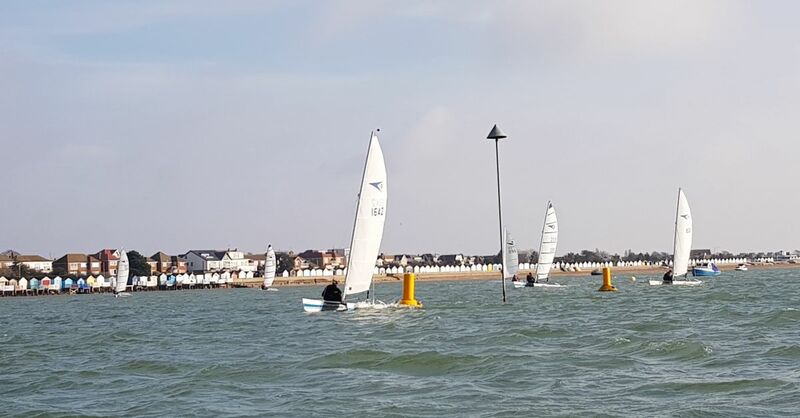 Heading on the second run out to the invisible Mark 13, a particularly strong gust came through the fleet – Rob Bailey was the first casualty – and much to everyone’s amazement, so was Paul Grattage. Jenny managed to stay upright (although not necessarily sailing in a straight line or, indeed, in the right direction) and rounded the mark just in front of Paul, who had righted his boat remarkably quickly. However, Paul soon sorted that out, getting ahead of Jenny on the reach and rounding the final mark just ahead. Jim, in third place at this point, played the shifts well up the beat and managed to sneak in front of Jenny on the finish line to take second. And those who had chosen to head all the way in shore appeared to make gains on those who had headed up the lay line. Gerald, Daren and Keith Person took 4th, 5th and 6th respectively. Another switch over of safety boat crews – and the Race Officers got Race 3 away promptly. The wind by now was much gustier and shiftier making the beats, in particular, a bit more snakes and ladders. Paul executed a third successful inshore line to the first mark – but those who had taken the same line behind him were largely outdone by those who had headed out for clearer air. Jon, Daren, Keith, Gerald, Jenny and Jim all headed round the mark together in search for the by now mythical mark 13. Again much of the fleet went high, allowing Jenny inside at the mark before heading down the reach with Paul some way in the distance. The fleet followed Paul all the way into the beach, despite the horrible headers but this still seemed to pay off vs those who tacked off earlier. The wind was heading a bit more by now, so most of the fleet need to tack again to get inside the distance mark. The fleet started to fan out along the beat and at the end of the second lap, Paul took the win, followed by Jenny, Jon, Jim and Gerald. The fleet then headed in to very welcome tea and coffee provided in the race hut and to admire the fact that Daren had sailed one and a half races with precisely one and a half intact wire strands remaining on his starboard bridle wire. Congratulations to Paul Grattage for a great win – and for travelling such a long way, despite the weather. The spot prize was awarded to Jim for capsizing, breaking a batten and mysteriously “acquiring” one in time to get back out for race 2. Ordinarily, we should have awarded Nigel James an award for not capsizing, but he has won too many spot prizes already. Big thanks to Paul Morgan for organising the event, to Chris Boshier and Howard Warrington for running the races so effectively, to Gary Burrows and Claire Morgan for the tea/coffee when we came ashore, to the caterers for providing just what we needed before and after sailing – and most importantly, the marvellous safety crew for enduring such conditions so we could blast around enjoying ourselves.